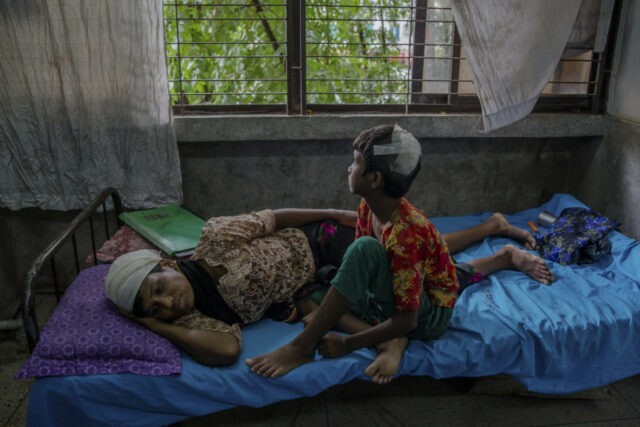 UNITED NATIONS (AP) — The number of Rohingya Muslims fleeing to Bangladesh since August to escape violence in Myanmar has topped 500,000, the United Nations said Thursday. “It is the largest mass refugee movement in the region in decades,” Haq said. Haq said aid agencies are working with the government to improve road access to refugee camps and are also trying to facilitate humanitarian aid deliveries by setting up “a one-stop shop” for the arrival of humanitarian supplies and facilitating approvals for incoming aid agencies. As of Thursday, Haq said, humanitarian partners have received $36.4 million — just under half the $77 million the U.N. called for in early September. “The scale of the emergency has far surpassed initial projections and the needs are being revised” upward, Haq said. The announcement of the spiraling exodus came just ahead of the first open meeting of the U.N. Security Council on Myanmar in eight years. U.N. Secretary-General Antonio Guterres, who has said Myanmar authorities are engaged in ethnic cleansing, is expected to brief the council. In a rare letter to its members, he urged the council to take action to end violence against the Rohingya and address the crisis. Council diplomats said the open meeting is an important step and demonstrates the body’s concern, but the council was not expected to issue a statement or adopt a resolution Thursday. The Rohingya have faced decades of discrimination and persecution by the majority Buddhist population in Myanmar, where they are denied citizenship despite centuries-old roots in the country. The current crisis erupted Aug. 25 when an insurgent Rohingya group attacked police outposts in Rakhine state, killing a dozen security personnel. That prompted Myanmar’s military to launch “clearance operations” against the rebels, setting off a wave of violence that has resulted in hundreds of people dead, thousands of homes burned and the mass flight to Bangladesh.